It must be spring break. How else could I get in two wargames in a week? 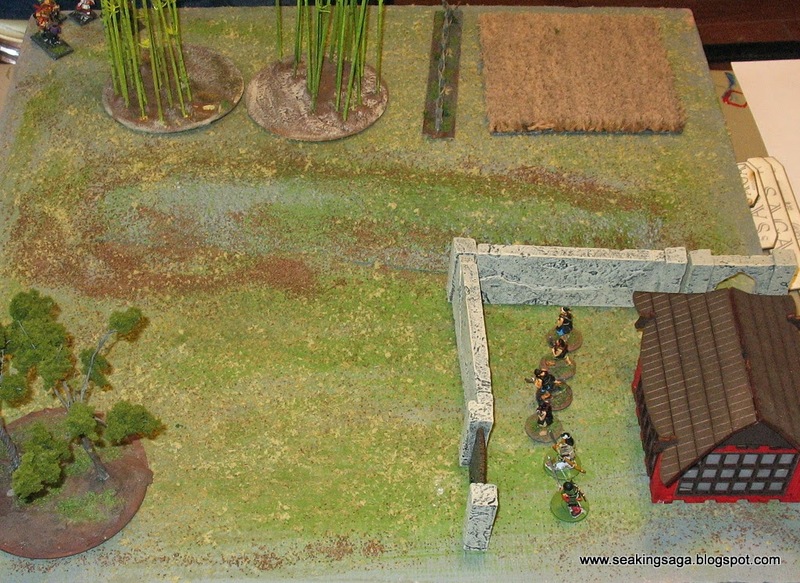 This time, it was Ronin, a skirmish wargame that is fast becoming my favorite ruleset. 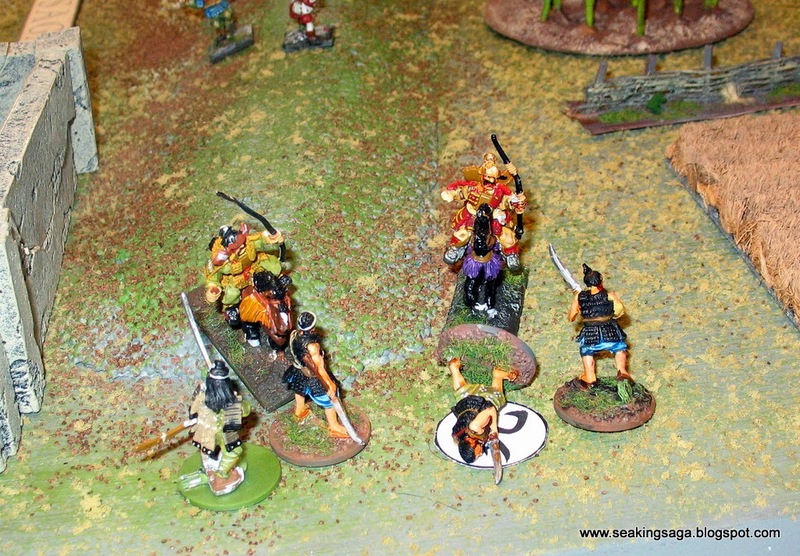 Ronin's rules for a warrior buntai (warband) gives two options - either hierarchical with more lower ranked warriors than samurai, or strictly higher class, with all rank 3 warriors or better. In this game, we played the two options against each other. 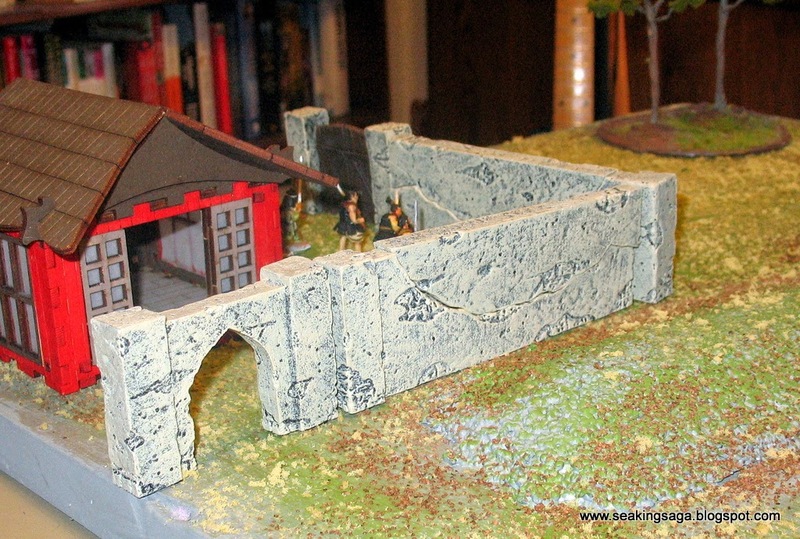 My buntai, holding a small country retreat, is composed of a hatamoto (rank 4), a samurai (rank 3) and 4 bushi (rank 1 or 2). 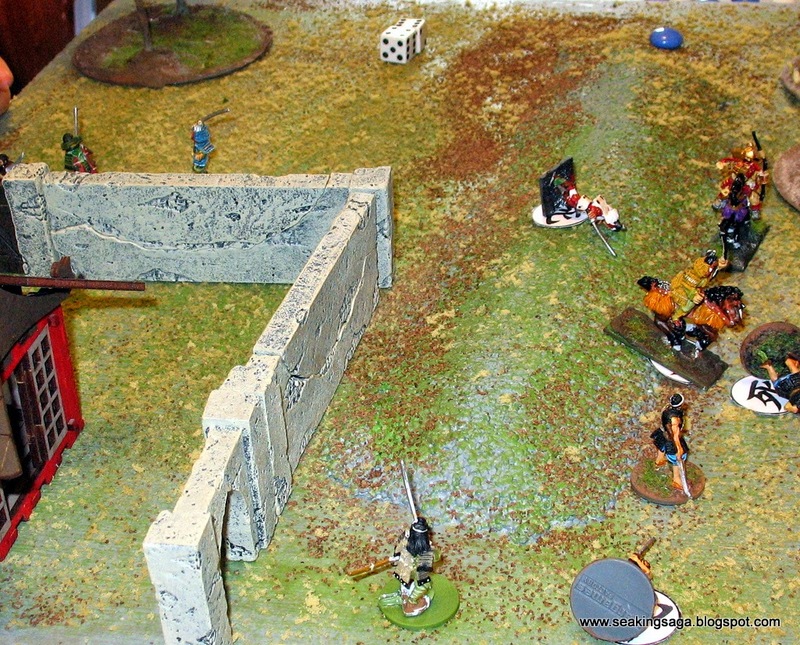 The enemy, two mounted and two foot samurai approach from the opposite corner. 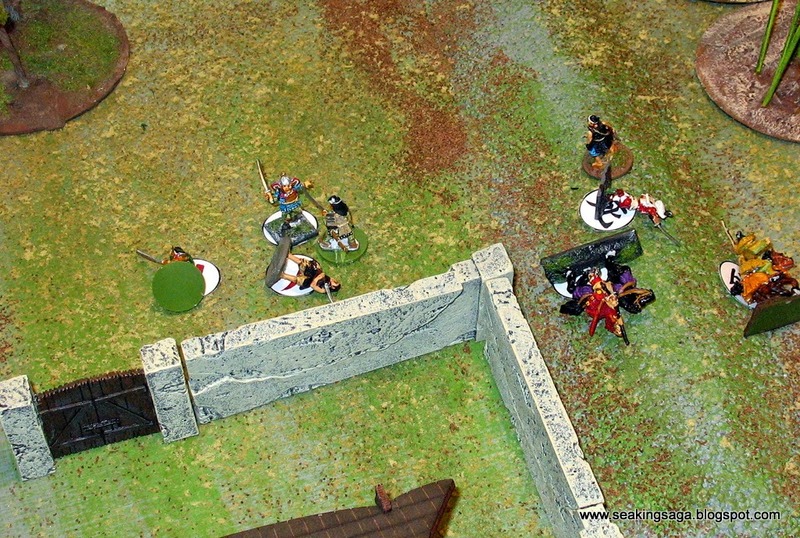 The samurai and 3 attendants stride out to meet the enemy. 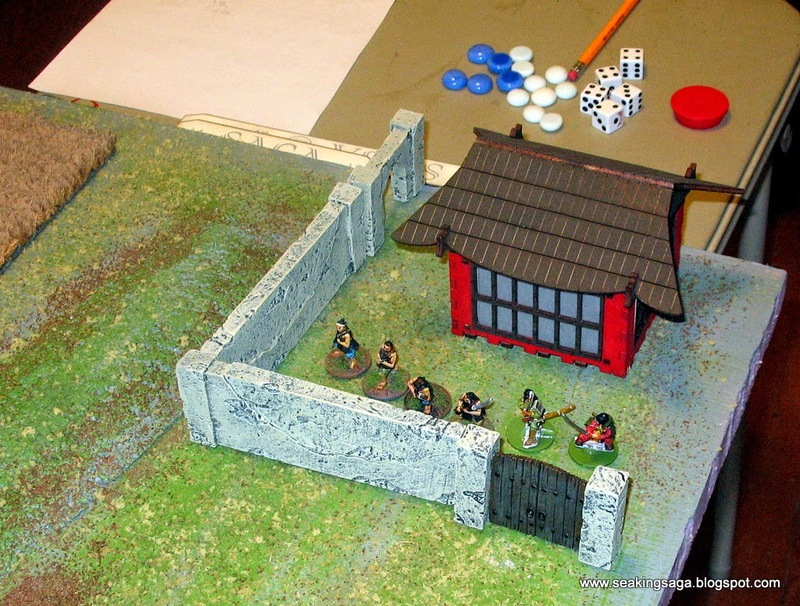 My initial plan was for my hatamoto and his attendant to defend the gates, but my sub-commander (five year old son) who was only supposed to function as observer. 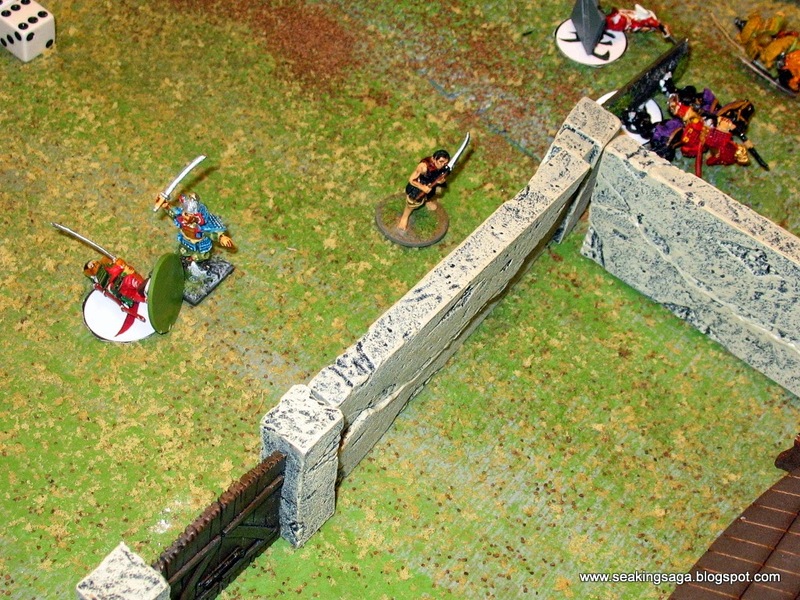 rashly moved the two models outside the wall. 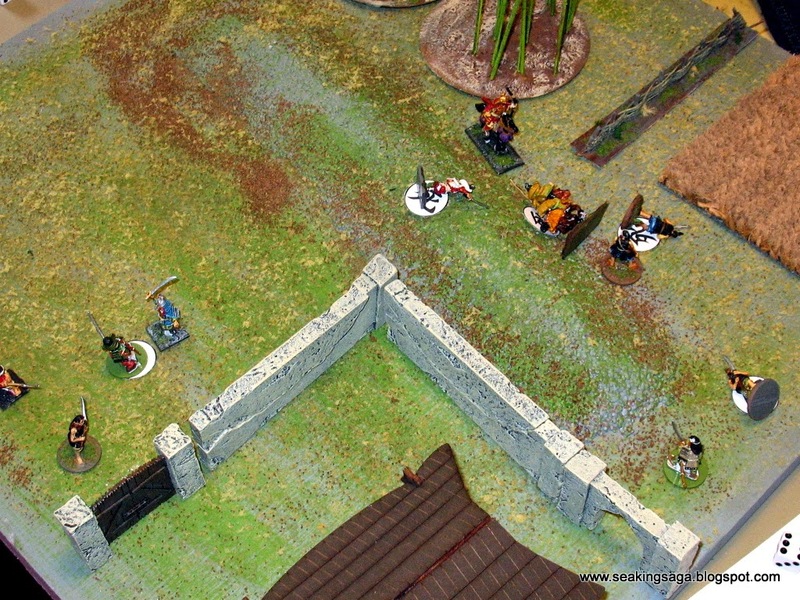 I made the most of the decision, and hopefully could catch the enemy from the flank. Fortune favors the bold! 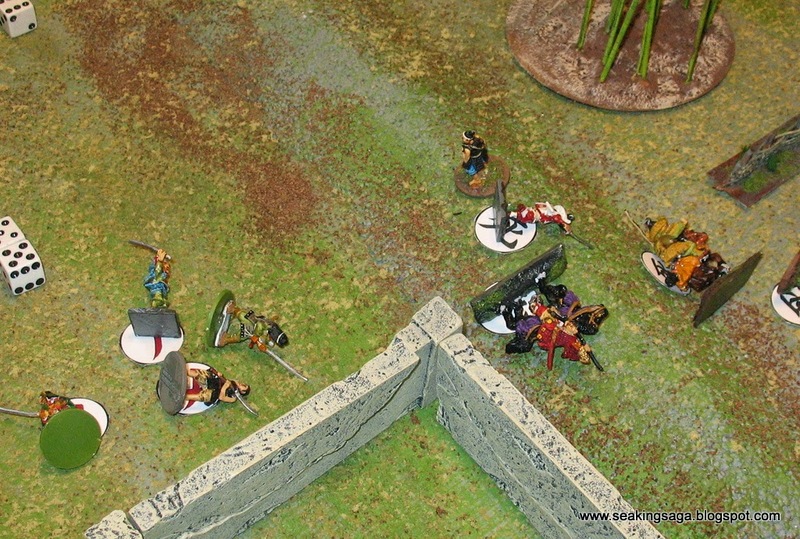 His horsemen fall due to some lucky yumi strikes from my samurai and my hardy attendants. The day is mine! 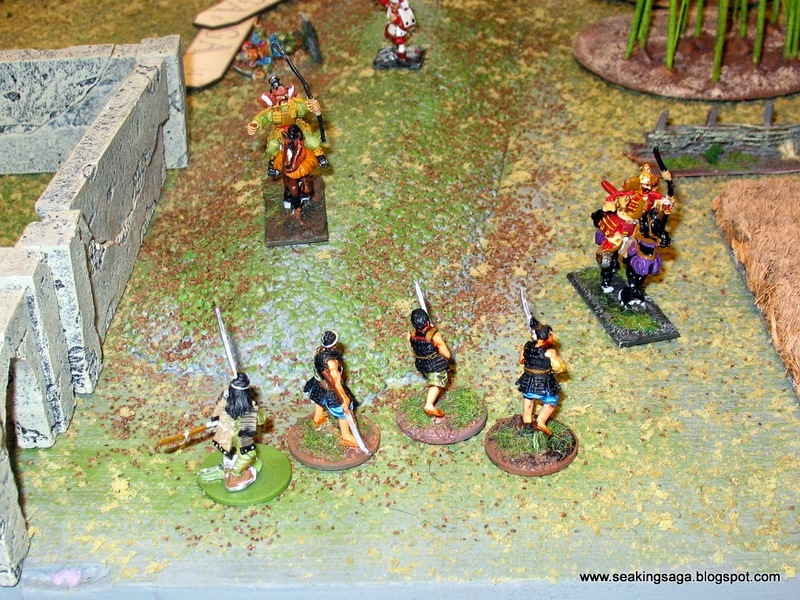 My opponents final model left is the samurai in blue. 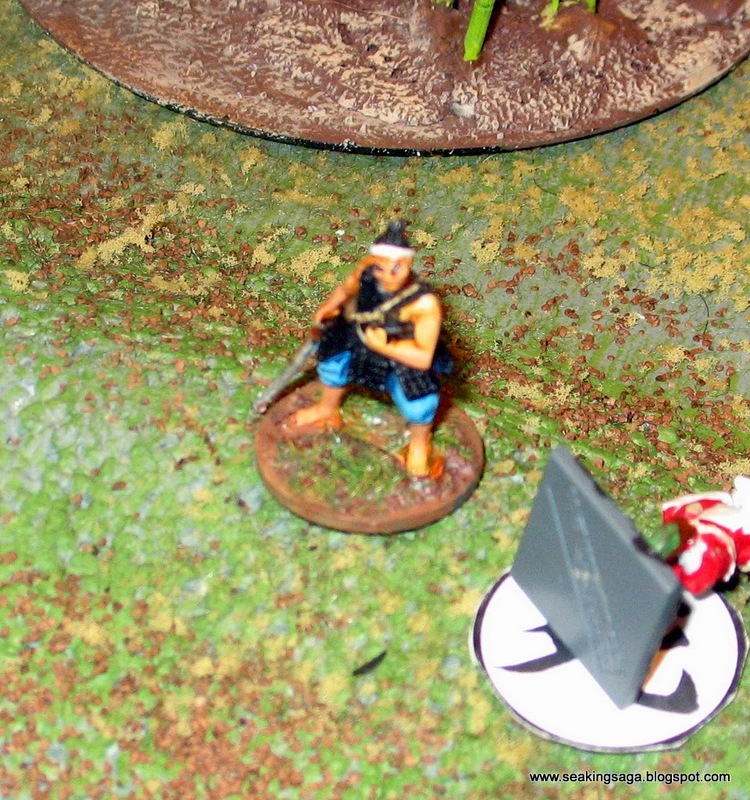 After taking out the attendant, I have two models left, an attendant and a samurai armed with a yumi (bow). Feeling confident and a bit honorable, I decide not to use the bow and move into melee. He was after all, already wounded. Both strike killing blows. Not a bad run for the last samurai. I like Ronin because it is a versatile but quick system. Weapons have statistical variations - katanas have no modifier for example, but the the two handed sword give you a +1 attack modifier along with a -1 initiative modifier. Which is significant, because initiative is key in this game since response attacks are not automatic . Other combat details such as mounted combat, reloading, and disarming are handled efficiently without becoming too granular. 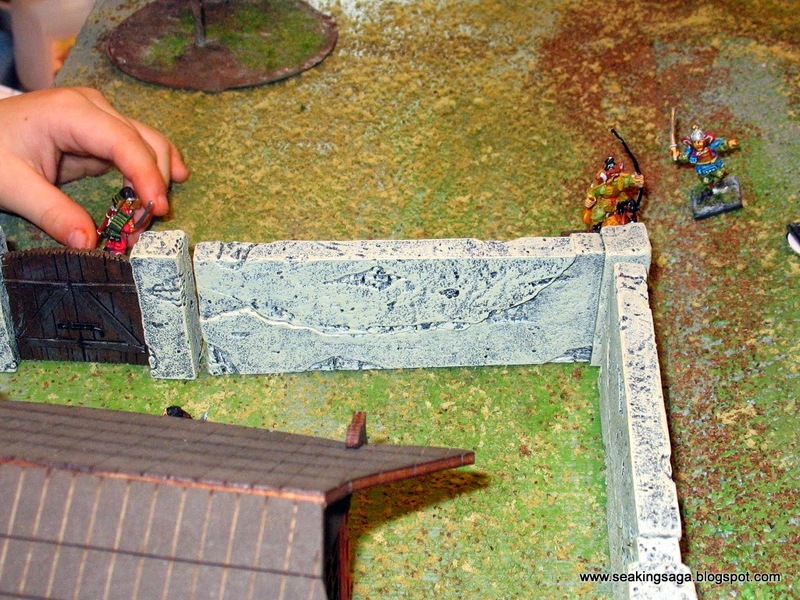 My models were Assault Group and West Wind and my opponents were from 1st Corp. 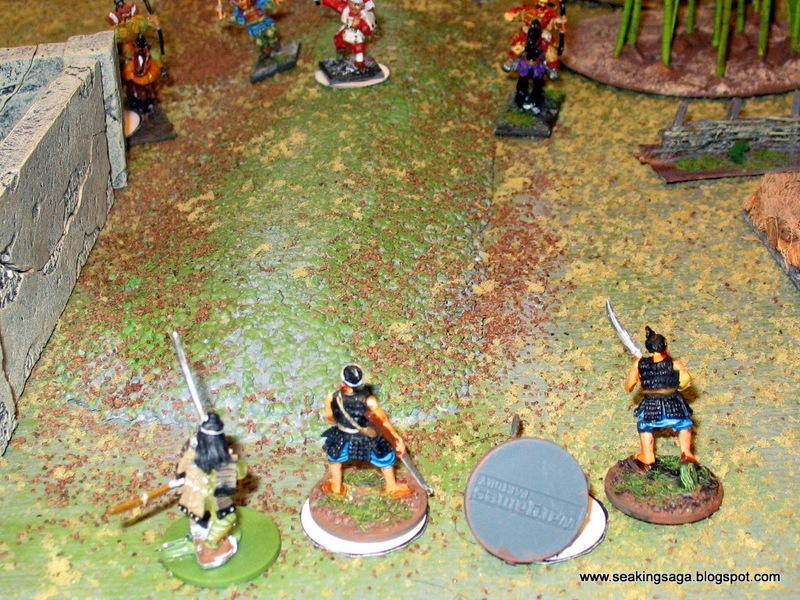 These are some of the better ranges for early samurai. I'll post some closeup comparison shots and reviews shortly. Nice write up. 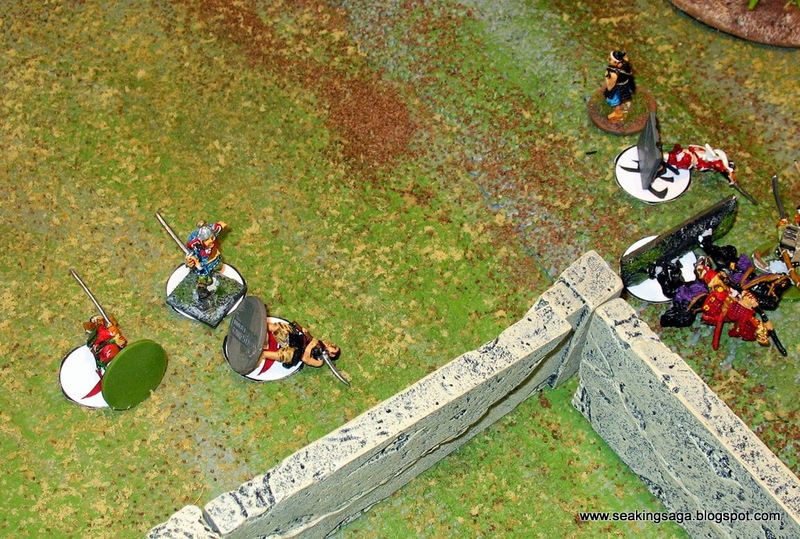 I'm having my first game of Ronin in a couple of weeks, so it's good to have some insights from people who've played before :-) Cheers, Paul.